Registration info when you need it. 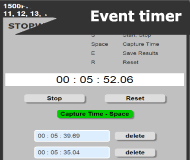 Speed up and improve accuracy of results entry for long distance events. Record times on one tablet, and registrations on another. Then match and save at the click of a button. Club manager helps you analyse your results data. 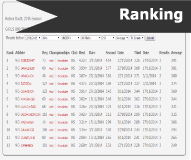 Along with the point score system this is useful for awards & championship selections. 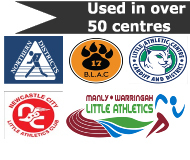 Wichsport products are used in over 50 clubs in NSW, ranging from 1,000 athletes to just 50. Wichsport will suit you too. Please note that some of the older tesimonials mention LAD & eLAD. LAD has since been renamed Club Manager & eLAD is now Club Website. LAD is a well thought out structured application, used easily for efficient and accurate data recording of athlete’s times. It took only 5 minutes to be shown how to enter times for the various age groups and events. It is very simple and intuitive to use without the user needing any prior computer knowledge – you only have to be able to know how to use the number keypad! Using a web interface and having wireless network connectivity to the backend application makes it extremely efficient as the data is entered directly at each event’s results table. The athletes are pleased that you can advise Personal Best times on the spot. As you enter times, “PB’s” are flagged and displayed and for the high achievers, any new centre record is also very visibly displayed. Even if you are not computer literate, this application is simple yet effective to use requiring minimal instruction to get you up and running. “My name is Darryl Welch. 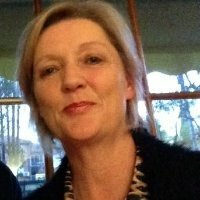 I am the Vice President and IT Officer for Manly Warringah Little Athletics Centre. Manly is one of the oldest and largest Little Athletics Centres in NSW and is made up of 6 clubs that compete against each other each Saturday at Narrabeen. Previously we used a system at Manly which is commonly used within centres to store athletes information and to record results. There were a number of difficulties that we had with it and found it to be largely unsupported. As a result we looked into what other options we had which is how I came across LAD (Little Athletics Data). Based on the functionality and abilities in LAD, and its integration with eLAD (the web site and hosting package available), myself and the Manly committee found it very easy to make the decision that LAD is perfect for our Little Athletics Centre. As a result we bought it and are now using it. Working for a software company myself, I had expectations that there would be a number of teething problems with the software both in downloading and inserting registration data from Clubs On-Line, registering people in LAD that showed up on the morning of competition, and in entering results. Much to my pleasant surprise, there have been no issues with the software that caused any sort of disruption to us. Our first day of competition was last Saturday (20/9/08) and everyone involved in the running of the competition as well as the club registrars commented on how smooth it went. As well as this, due to some of the features in LAD it actually cuts down on the work required by a number of our track and field officials which everyone was most happy about. We have had issues with getting enough parents to assist in the running of competition so anything that makes life easier is a huge advantage. I am not sure what other packages you are looking at, or that are out there, I can only compare LAD to the system that we use to use. It is browser based, not an application that needs to be installed on each PC. This means that we can easily use any laptop (or PC) out in the field to enter results (with a wireless network). Our objective is to have each age manager with their own aptop to enter the results in as the athlete completes their turn. This will cut down on the need for parent helpers to sit in a room to enter data and, more importantly, it gives the children real time feedback on if they have achieved a PB. We try and encourage children to be their best and being able to tell them immediately if they have achieved a PB will really help to reinforce this. It is so easy to use. On Saturday we had a grandmother of one of the athletes entering data after reading a brief instruction sheet. It is very easy to set up and configure. You do not need any real computer skills to set it up and administer it on a day to day basis. It is very intuitive and straight forward. If you have used a PC and have very basic computer skills then you can look after it. It has very good validation to ensure that results are recorded correctly. While human error is always possible, LAD cuts this down dramatically though the validation of data that it has. It stops people entering data for wrong events, age groups etc. It is able to easily accept the registration from Clubs On-Line as well as having the ability to register people directly into LAD (e.g. at registration days where there is no internet connection to Clubs On-Line) then upload the data to Clubs On-line. Manly has a very complicated points scoring system with different awards for clubs and the centre which are all calculated differently. LAD was easily able to accommodate what we required without us having to change the way that we do things. This was a major concern that we had. We didn’t want the software to dictate the way that we had to do things, the software had to be able to do things the way we have always done things. It did. It keeps track of parent duties performed. We have for many years had difficulties in tracking which parents have helped on competition days. We continually had the same people doing work while others did nothing. It was a real problem for us. With LAD we are able to easily track this to ensure that everyone does their fair share which should help competition days run smoother. LAD has been developed specifically for the way that Little Athletics is run in NSW so is a perfect fit for the way that things are done. I am always weary of “generic” software of this type that is modified to support other ways of doing things. As I mentioned before, I work for a software company and know the issues that this sort of thing causes for support and changes in the future. The support from the supplier has been excellent and fast. I have had numerous questions and requested a number of small changes to accommodate different things that we wanted to see in the software. The supplier has always responded promptly and gone out of his way to accommodate us. Having one of the largest little athletics centres in NSW it is critical that I know that we can rely on fast and efficient support if needed. It can create many reports to give crucial information such as medical information for children, championship/representative selection reports, registration information etc. This will make life so much easier for us and with things like championship/representative selection, take out any controversy or subjectiveness. The integration with eLAD which we use for our web site is fantastic, especially the ability for the children to view their results on-line. Children use to have to wait for 2 weeks to get their results and the administrative headache of getting the printed results to so many children was a real pain. Now it is so simple to upload the results. As I mentioned before we have only had 1 competition day and since then we have had so much positive feedback on children being able to see their results. It is very pleasing and gives me real comfort that we made the right decision. There are more benefits of LAD that I could go through but I think you get the idea. 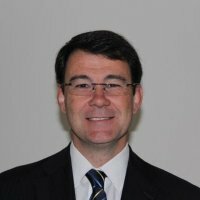 Hello my name is John Terranova; I am the recorder for Raymond Terrace Athletics Club. I have been using this program for the last year and it has been very good. There were some teething problems at the beginning as it was set up for a larger club than us. We are around the 200 members mark, but with the support from Michael and a few modifications, we set it up to run for small clubs. If I had any problems with anything the support was excellent. I either rang or sent as email and received a reply within a day and sometimes with the repair or request for new function in the program already done. If you have any questions please feel free to send me an email or phone me on the number listed below. I just wanted to drop you a line and let you know that for the 2nd week in a row, as a shot put recorder, I have had the opportunity of using your great computer program. How easy it is now to enter all the results. Anything that I can do once, I hate to have to do twice. By using the computers, at the event, the results are inputted immediately which means no-one else is required to do it a second time. Fantastic!! Faster, better, smarter . . . not just on the track! Have a good week. © Wichsport. All rights reserved.